The butteriest parker house rolls are here. And I’m on a roll to make butteriest a word. I don’t think that it’s in the dictionary, but it totally should be. So here’s the thing. I feel like a total hypocrite talking about rolls for Thanksgiving. Until now, I’ve very much been in the camp that no one should spend allll the time making bread on Thanksgiving day. (Even these garlic butter pull aparts couldn’t sell me.) And that’s pretty much when it has to be baked because fresh bread is the best bread. Right? So up until now, I’ve never wanted to fully bake bread on the day. There are so many other delicious sides to take care of. So many other dishes that we only eat once a year, so many other things that I want to use my oven for, so many other dishes that make such an impact. It also probably comes down to the fact that I’m not a huge bread person. I know… what does that even mean? But now? I’m in a real pickle. I’m dying to make these on Thanksgiving day! They are THAT GOOD. 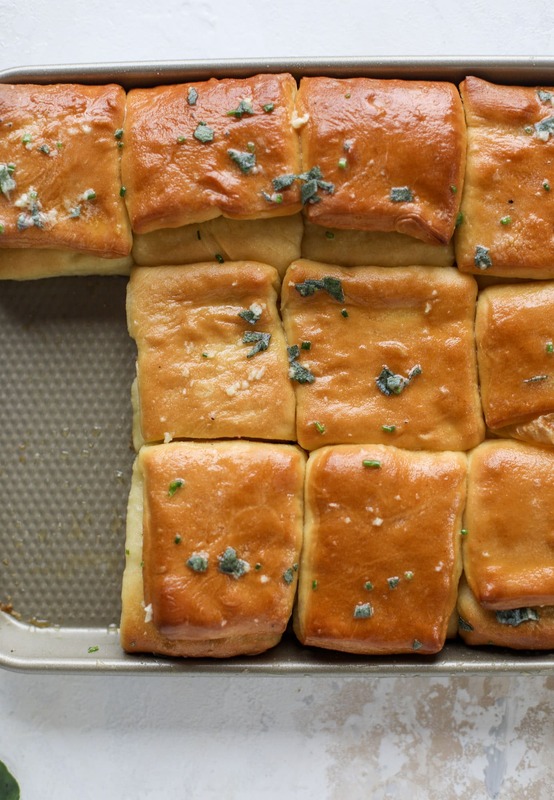 These parker house rolls are filled with so much buttery love. These really are by far the butteriest rolls I have ever made – and they are to die for. Eddie used them for sandwich rolls. My mom ate them with dinner for a few days. I couldn’t stop pulling them apart and eating one side… then going back for the other. They are SO incredibly soft and fluffy and buttery and good. There it is. The argument on why we SHOULD make bread on Thanksgiving. Yes, I think the dough could be made the day before, taken out of the fridge the day of baked. Just makes sure there is lots of butter. Like LOTS. 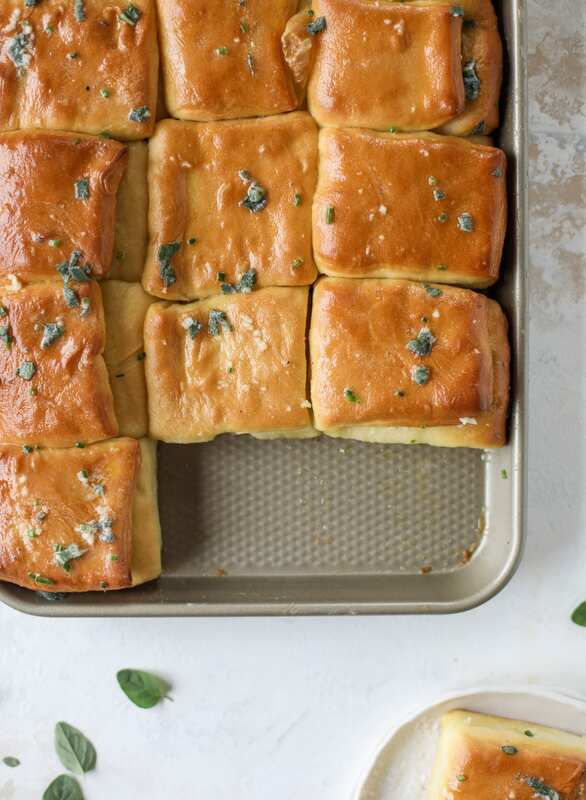 Garlic herb parker house rolls are full of incredibly buttery flavor! 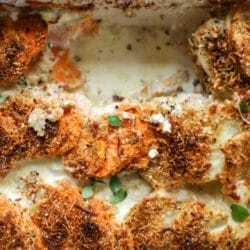 They are brushed with a garlic herb butter and are super fluffy, soft and tender. Perfect for Thanksgiving or the holidays and you can make the dough a bit ahead of time! In a bowl, stir together the yeast, water and honey. Let it sit for 10 to 15 minutes until the yeast gets foamy. While the yeast is blooming, heat the milk in a saucepan over medium heat until it is simmering. Remove it from the heat and stir in the sugar and the butter. To the bowl of an electric mixer with the dough hook attached, add the eggs and salt. Beat in the yeast mixture, milk mixture and half of the flour. Add the remaining flour, about 1/2 cup at a time, until the dough is smooth and silky. Knead it by hand a few times on the countertop. Place the dough in an oiled boil and cover it to rise for 1 1/2 to 2 hours. In a bowl, whisk together the melted butter, garlic cloves and herbs. Brush a parchment pan with a light coating of melted butter. Once the dough has risen, punch it down and turn it out on a floured workspace. I separated my dough into two pieces. Roll each out to be a large rectangle, about 8 x 10 or 12. Brush the dough with the melted garlic herb butter. Slice it in half lengthwise, then fold each side in half lengthwise. Slice 2 to 3 inch rolls from each piece and place them in the buttered parchment pan. Repeat with the remaining dough. Cover the pans and let them rise for 45to 60 minutes in a warm place. Preheat the oven to 350 degrees F. Bake the rolls for 25 to 30 minutes, or until the rolls are golden brown. Remove from the oven and brush with more of the garlic herb butter. Serve immediately! You could also make a pan of sliders here too. Ooooh my gosh. YES! These are the perfect rolls for Thanksgiving or for any celebration. Wow those look insane!!! Can’t wait to try them!! I used a different recipe for Parker House rolls for Friendsgiving last weekend and my result was disappointing. Not much flavor, and I think my yeast was old. I’m making these next week, no question! i definitely think you can too! oh my gosh. that sounds like a dream. once they are sliced? i just do one fold! I always make your Buttery Cloverleaf Rolls from 2011 for Thanksgiving. Other shapes are often doughy/not quite baked through for me, but I’m successful every time with your cloverleaf recipe! The parker house rolls look very tempting though, so I’ll try them soon on a regular day when others aren’t depending on me to provide the holiday favorite. 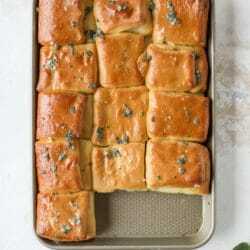 Any ideas for how to make these ahead of Thanksgiving Day? Do you think if I bake them just enough, but not browned, I could freeze and then finish cooking later? hmmm i think i would prep the dough the night before and have them ready to go in the fridge (in the baking pan) – then bake the morning of? i’m not sure about partially baking – i’ve never tried that! I froze them and they were sooooooooooo good after. I can’t tell you they were the same but they were definitely amazing enough that I was jealous of myself when I finished. Do you think you can make these by hand without using a mixer?! Please help! i think you can! just use a big bowl and lots of stirring and kneading by hand! Should the butter be cold or room-temp when it is added? Thanks very much and happy Thanksgiving! Never mind – I figured it out. Thanks! These look amazing! Do you think it would work to sub milk for coconut or almond mills? My whole family was obsessed with these! Oh my gosh, Jessica, I have never gotten so many compliments from any other bread recipe I’ve made in my life!!! Everyone was crazy over them and they are just so PERFECT. Served them with French omelets and took the leftovers to work the next few days to fill with sliced cheese or cream cheese – best.lunches.ever. Thank you thank you thank you thank you! Eating the last ones now. Yum yum yum. So sad this epic part of my life is almost over! I guess I’ll have to make more tomorrow.